It will be interesting and, we hope, instructive to many, to endeavour to trace his teaching and his intentions in his works. The very first criticism we make on his works is that in every case we find an evident intention - some story is told, some conception worked out, though the whole of the story or conception is not given, and we are left to imagine some things and to connect others. 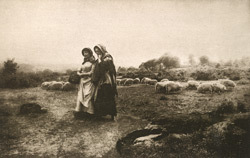 At the first blush we should expect the two women in 'Carolling' to be joyous and frivolous, but we find one is not so gay as her companion; she looks back as well as forward, she has doubts as well as hopes, and her comparative gravity enhances the gaiety of the other, and gives intensity and intention to the episode."